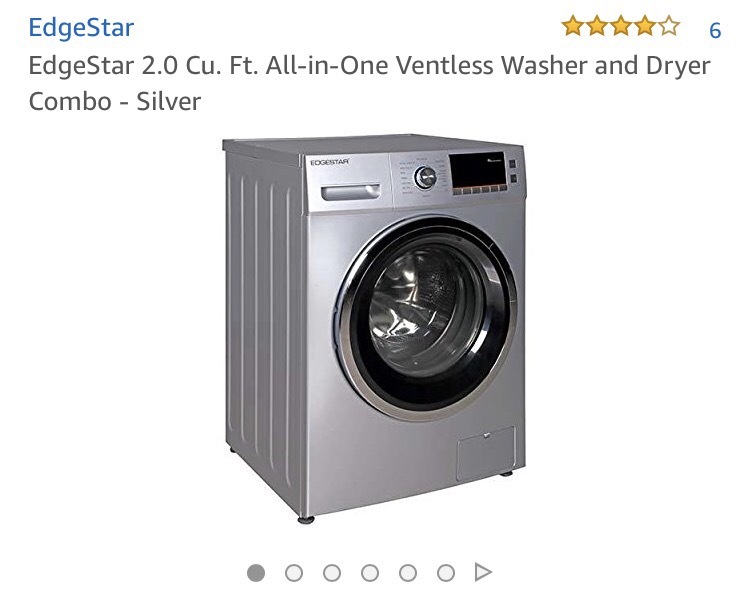 We ordered our Edgestar Washer/Dryer Ventless Combo unit on Amazon and it got to us in less than a week. So far I love it!!! I did a lot of research after that on which unit I wanted next and wasn’t happy with any that I found. Then I came across the Edgestar on Amazon and knew this was the one. We had watched an Edgestar video on how to replace a thermistor when our Dometic started acting up (Dometic was no help) so I knew they were similar. So far, the Edgestar is the best we’ve had. It does a larger load of clothes than either the Splendide or Dometic and dries them completely set on the least dry setting. I’ve done towels, sheets, my clothes, Allen’s work clothes, and all the loads come out clean and dry. No drying rack needed! It has a self clean option, an extra rinse option, 3 levels of dry, normal, heavy, sheets, sanitary, delay, and some I haven’t used yet. And it was about half the price of the previous 2! We paid around $950 for the washer AND extended warranty (I’m a HUGE believer in these!). Whereas the Splendide was $1600 and the Dometic $1500 with no extended warranties. Highly recommended! However, I’ll for sure let you know if we have issues (knock on wood) with it in the future! This entry was posted in 2015 Grand Design Momentum 385TH, Camper, RV and tagged 2015 Grand Design Momentum, 5th wheel, amazon, camper, camper life, Dometic, dryer, Edgestar, fifth wheel, full time RVing, Grand Design, Grand Design Momentum, laundry, Momentum, RV, RV laundry solutions, RV life, RVing, splendide, splendide 7100xc, traveling, washer, washer dryer combo by Rachel Gillen. Bookmark the permalink. Reviews on Amazon suggest to take out the soap dispenser when drying as that acts as additonal water vapor vent. Thanks for the update! If you left he soap dispenser open for a vent would that also be introducing moisture into the RV? Or do the ventless units do that already? I don’t notice extra moisture from it. We keep a DampRid container in the closet and in both bathrooms and change them as needed, but I don’t notice extra from the washer/dryer. Fantastic. Thanks for the pass along. We are going to be in the market someday and this will help us make a selection. Do you have an opinion on ventless vs vented? It sounds as if you are happy with this model of the ventless. I know people complain that ventless takes too long to dry, but we are so used to it at this point that it doesn’t bother me. I haven’t used a vented model to compare so I can’t really do that. But I’m happy with Edgestar so far!